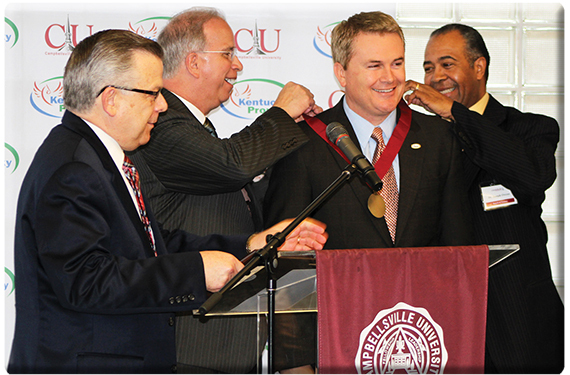 CAMPBELLSVILLE, Ky. — Campbellsville University and Kentucky farmers alike will benefit from CU’s entrance into the Kentucky Department of Agriculture’s Farm to Campus program, Agriculture Commissioner James Comer said. "We are excited about the Kentucky Proud partnership, and we like to promote local business as much as possible,” said Heath Hall, Pioneer College Caterers director of food services for CU. “It is also great to know exactly where the Kentucky Proud food we purchase comes from for the students at Campbellsville University." Under the Farm to Campus program, the KDA will partner with CU and Pioneer College Caterers to put more shelf-stable Kentucky Proud products in the CU Bookstore and more farm-fresh Kentucky Proud products in the university’s food service system. Campbellsville University is the sixth university in the Farm to Campus program, joining Asbury University, Eastern Kentucky University, the University of Louisville, Morehead State University, and the University of Pikeville.